SAULT STE. MARIE — If you want to get your Valentine a sweet surprise, check your winter coat, drawer, wallet, purse or car if you were in the Bracebridge area a year ago. Because you may have a winning LOTTO/649 ticket worth $100,000. But act fast, there are just two weeks left to claim the Super Draw prize sold in Bracebridge. 5 – 5 – 4 – 5 – 6 – 8 – 9 – 8 – 01. Players must exactly match the numbers drawn to win the $100,000. 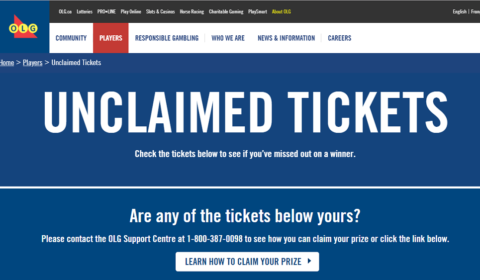 The owner(s) of this ticket should fill in the back portion, sign it and contact the OLG Prize Centre at 20 Dundas St. West in Toronto before 6 p.m. on Thursday, Feb. 14, 2019. The OLG Prize Centre is open Monday through Friday from 8 a.m. to 6 p.m. and Saturday 9 a.m. to 3 p.m. So, what happens to unclaimed prize money if no Valentine steps up? “Unclaimed prizes from National draw games (LOTTO MAX, LOTTO 6/49, DAILY GRAND) are returned to players through future bonus games or promotions. How much money went unclaimed last year? What store was the winning ticket sold at? “We don’t reveal the location of where the winning ticket was sold as we need the person(s) with the winning ticket to tell us that information as part of the prize claim review process. “This process ensures that we are paying the right prize to the right person(s). Quick, look around, you may have misplaced a $100,000 lottery ticket sold in Bracebridge last February. Winners of up to $250,000 also have the convenience of dropping off winning tickets for processing at participating gaming sites. Please call the OLG Support Centre 1-800-387-0098 for more details or a list of locations. Information about this and other unclaimed tickets is available by visiting the Unclaimed Ticketspage on OLG.ca. Use the easy self-serve Ticket Checker at your lottery terminal retailer. Simply insert the ticket, barcode side up, and wait for the message to appear on the Ticket Checker’s screen. Or call their WIN! Line at 416-870-8946 (Toronto area) or toll free at 1-866-891-8946 (outside Toronto area). THE ONTARIO PROBLEM GAMBLING HELPLINE 1-888-230-3505.